As you can see in the long term chart below, oil is a volatile commodity, with it's price swinging wildly in a range from less than 1 gram per barrel to almost 5 grams per barrel. But this chart also shows that these oscillations are part of a sideways price movement centered around 2.5 grams per barrel. Crude's current price around 1.5 grams is quite a bit below its historical average. Of course, the fluctuating value of the dollar makes it very hard to gauge whether oil prices themselves are rising or falling… Oil today at 1.5 grams is cheaper than it was in the early 1950s; but if you measure the price in US dollars, you would get the impression that it is about 30 times more expensive today! really very interesting and very impotent blog i benefited a lot thanks for such a nice blog you content of this blog is really fact and your point of this blog really noticeable thanks for that useful info really thanks by heart. yes a very impotent blog 🙂 ..and I too have benefited so much.. you're the best and I like being here and.. Ok seriously though…where do you get your charts that show data that far back? Interesting to see long term moves over several decades. Hi Charles, thanks for a truly excellent site. I've just subscribed and am wondering if you'd consider publishing an historical chart of natural gas priced in gold? Many thanks! I notice that these charts for crude oil are based on West Texas Intermediate (WTI) crude – today between $98 and $99/barrel. But that's the crude gushing into the U.S. from the many huge pipelines from Canada. The rest of the world pays for "Brent" crude, currently almost $120/brl, a solid 20% higher. The printed money and also the Oil are loossing power we need to ask what have real Value and act acordingly. 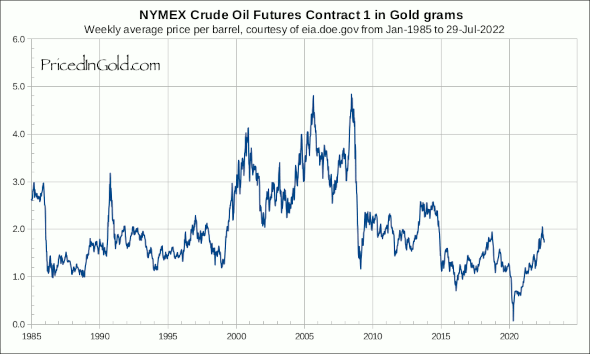 Have you ever considered charting Brent crude, priced in gold? I notice that Brent tracks CRB (as a proxy for "stuff") more closely than WTIC. We really need an overlay of the chart for price of gold in dollars to see if this is important or not. I suspect not. Stu, the point is that the dollar is not a constant measure of value, so when you see the price of oil skyrocket in dollars you have to ask yourself "is this important or not?" 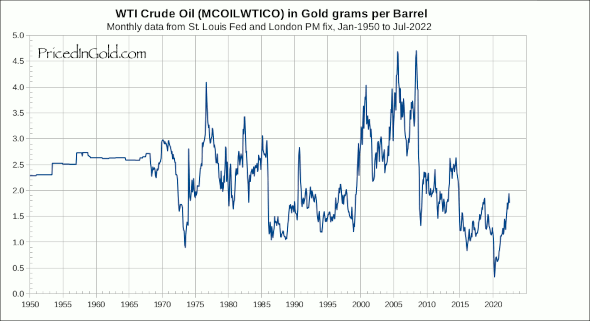 As you can see by pricing oil in non-dollars (gold) the price of oil is a lot different than it appears. In other words, most of the variance is actually a loss of purchasing power in the dollar rather than a rise in the value of oil. the Golden constant….. is the price of oil has been on average equal 2.1 to 2.35 rams of gold since 1900 or 4 gold schilling!!!!!!!!!!!!!!!! Oil is approching its bottom mesuring in gold. 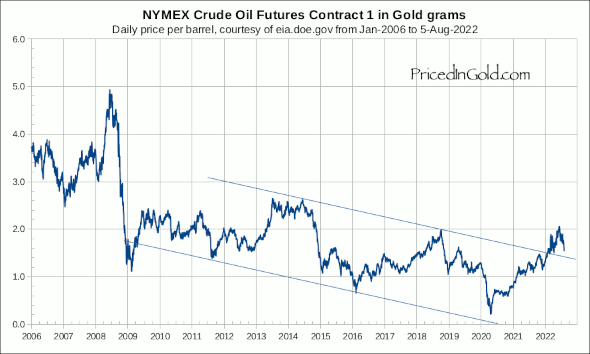 Against gold, oil is a very good investiment to jump in now.